You heard me right. I have been using the 2018 iPad to do everything I usually use the Pro for: taking notes, writing stories, working on images, sketching, communications, research, watching movies, listening to Apple Music, even playing my favorite game (which is still Rome: Total War, for some reason). No performance compromises, no in-app stutter, no lag, for the most part almost everything feels almost exactly the same. That’s not surprising when you think about the powerful A10 Fusion chip (as used in iPhone 7) inside the 2018 iPad, which is actually faster than the A9X chip inside the 2016 Pro, according to Geekbench. 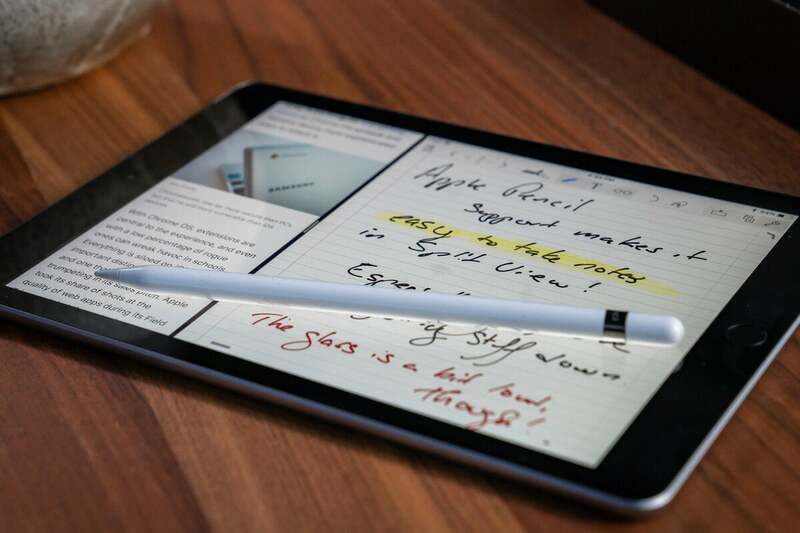 (Apple claims it to be 50 percent faster than last year’s iPad.) The new model is also equipped with 2GB RAM, just like the 2016 Pro, though the current top of the range boasts more. While you won’t be able to use background apps if you open a third app in Slide Over while working with two other apps in Split View, you can still happily use other iOS 11 Multitasking tools. Battery life? Given Apple’s persistent record in under promising and over delivering, don’t be surprised if you get more than the advertised 10 hours in normal use. If you like to write (or sketch), you’ll also need to get an $89 Apple Pencil, which works with this iPad. I’m not especially artistic, but I do like sketching, and I find little difference working on either the 2016 Pro or 2018 iPad. Pressure and tilt sensitivity are just as good. I do note that the experience feels slightly different due, I think, to the lack of reflective coating on the entry-level device. Feeling isn’t everything: The display refresh rate is a little slower (60Hz v. 120Hz on the Pro). This can make for a little lag when you draw – most people writing or sketching on the tablet (like me) won’t notice this at all, though some pro artists might. If you need the best available art tablet, you might want a Pro. But for everyone else, Apple’s new tablet really does the job here. On first glance, the 2018 iPad keeps to tradition; it looks like last year’s iPad, which looked like 2013’s iPad Air. With larger bezels around the side, the tablet is thicker (7.5mm) than the current Pro (6.1mm). And where iPad Pros have four speakers, the new iPad has just two. A word about the 9.7-inch display: The iPad boasts fingerprint-resistant oleophobic coating, but only Apple’s Pro range is fully laminated with an anti-reflective coating. That means you can see the gap between the display and the glass above it on the new iPad, which you won’t see on a Pro. Anecdotally, I find the lack of lamination means it feels much more like I’m poking a sheet of glass when I work with the 2018 model. The Pro seems a little “gentler” to touch. You also get Apple Pay, Touch ID, iOS 11, and most everything else, including a headphone jack, though when you look you’ll find no Smart Connector. Given that I think the only useful Smart Connector accessories are Apple’s rather cramped Smart Keyboard or the Logitech Create, I can’t summon up much concern about that. Use some cheap Bluetooth keyboard, and get over it. Is that harsh? Perhaps, but it’s just not that big a deal to me. For me, camera quality is the biggest compromise in the tablet. The 2018 iPad offers an 8-megapixel camera in contrast to the 12-megapixels inside older and current iPad Pros. There’s no optical image stabilization and no flash. I guess Apple did this to shave a few dollars off the cost. And while it competes well with those second-rate, camera-free Chromebooks (that cost the same and are useless if you’re not online), I do think it could have pushed its video creativity in education message much harder with a higher quality camera inside. Of course, it’s not just the megapixels that do the capture; it’s the quality of the software used to process and edit the image, and that’s where Apple’s years of advances in imaging really show. I’ve been able to create video seamlessly without dropped frames, stutter, or other errors. I was surprised at this at first, but it’s pretty clear to me that the 2018 iPad is a peer player in comparison to the 2016 iPad Pro. The processor comes into its own on such tasks. I do note that if you want to do something more serious with the movies, the iPad Pro models both support 4K HD, while the 2018 iPad will “only” handle 1,080p HD. Apple’s aiming this iPad at schools, and for school video projects, the capacity to capture and edit 1,080p HD at this kind of price is still a beautiful thing. On the same tip, storage on the new model maxes out at 128GB ($429), while the current Pro range boasts a maximum 512GB ($999 for 10.5-inch model, $1,149 for the 12.9-inch). If you want your iPad to be capable of making 4K HD video, you’ll need the storage space – but you may feel that the extra c.$600 it will cost you might be better spent on a second-hand Mac for editing tasks, giving you a little of both worlds. You can also get hold of relatively inexpensive external storage dongles to offload archive material if you are working on a movie using a 2018 iPad in the field. If the fast, powerful 2016 iPad Pro was the tablet equivalent of a Koenigsegg, the 2018 iPad is a similar car with a faster engine at half the price. It even offers better performance specs than most of the non-Apple tablet competition at any price. The entry-level iPad seals Apple’s position at the head of the tablet game, and if you want a good value-for-money tablet that’s still one of the best money can buy, this is hard to beat. The current iPad Pro range, of course, remains king of this road.